Listeners heard a charming rendition of Mozart’s playful Andante and Five Variations in G for piano, four hands, with Michael Brown joining [Gloria] Chien. And Mr. Brown’s reading of Glinka’s variations on a Mozart theme was a highlight by the sheer force of his playing, his sound gently radiant. Michael Brown, who played a piano recital Sunday afternoon as part of the Steinway Series at the Smithsonian Museum of American Art, is identified as a pianist-composer, that musical persona with a glorious past. Pianist-composers go back to the likes of Mozart, Clementi and Beethoven in the late 18th century and had their heyday in such figures as Liszt, Chopin and Gottschalk. But after the careers of Rachmaninoff, Bartok and Prokofiev in the mid-20th century, there was a distinct falling off. Presumably Brown would like to change that. Variations and fugues are the overriding themes of pianist/composer Michael Brown’s captivating new album (on First Hand Records) that pairs his own music with pieces by Leonard Bernstein, Felix Mendelssohn, and Beethoven...This is an altogether smart and enjoyable release. The Concerto No. 1, tricky for the conductor, is a brilliant showpiece for piano. It’s clear Shostakovich wrote it for himself to play. It’s a substantial, meaty piece of music, which generally means it’s also a handful...Brown, a past Rising Star of the Gilmore Keyboard Festival, returned to West Michigan to give a performance that was clean and precise but still with an undercurrent of passion just below the surface. The Jupiter String Quartet gave an exciting concert of chamber music on Nov. 30 in the Foellinger Great Hall. The quartet members, Nelson Lee and Meg Freivogel, violins, Liz Freivogel, viola, and Daniel McDonough, cello, were joined by pianist Michael Brown, who is also currently composer in residence with the New Haven Symphony in Connecticut. Mr. Brown's playing was so clear and thoughtful in the sad and somewhat hesitant piano solo that begins the Andante sostenuto. ... The final movement begins agitato, with Mr. Brown running off a jaunty piano bit before all join in. The piano is in fact quite prominent throughout this Allegro con brio: from a quaint tune to an almost "toy" piano moment, Mr. Brown has it all superbly in hand. Michael Brown at the Steinway played with thrilling verve and clarity [in Prokofiev's D-Major Sonata for Violin and Piano] ... Kristin Lee, a beauty in black, was so impressive in her technical command, with Mr. Brown an ideal colleague in both the passion and beauty of his playing. As the duo embraced at the end of their superb performance, the audience lavished well-deserved cheers upon them. In the July/August 2017 edition of International Piano, Benjamin Ivry considers the work of Michael Brown in the context of pianist-composers from the time of Clara Schumann to the present. Brown’s Folk Variations, Ivry writes, "is an authentic major work, in which close listening, especially to silence, is treasured. In theme-and-variations form, based around the tune Yankee Doodle, it has the added complexity of not actually including the melody of Yankee Doodle in its thematic section. Instead, Brown explains, Folk Variations ‘rather uses [the song’s] pitches rearranged and stacked vertically to create a more modern “American” sonority.’ One of the most refined of all pianist-composers, Brown may, like Samuil Feinberg, eventually be promoted to the status of composer-pianist." Pianists Gilles Vonsattel and Michael Brown played superbly [in Barber's Souvenirs], the opening mark in a concert in which all the performances were at the highest level. Mr. Brown devised an intriguing program juxtaposing the rarely performed Mendelssohn Preludes and Fugues op. 35 with contemporary works (his own and that of Leonard Bernstein). The underlying theme was, as we heard, that of fugue and variation: a very clever concept representing a thinking pianist rather than the more typical Juilliard-graduate-virtuoso. An interview / feature on Michael Brown that addresses his background and future as a pianist/composer. Violinist Elena Urioste and pianist Michael Brown...are polished, immensely self-assured prizewinners who come from prestigious musical backgrounds...Urioste produces her full-bodied, slightly grainy, always pleasing sound with a physical ease that reflects her long-standing interest in yoga. She is capable of the most exquisitely hushed soft playing, the kind that grabs the heart and holds on to it. Brown, who is also a composer, is an intelligent and musical pianist. A large audience in Great Barrington’s Mahaiwe Theater braved the snow and cold for a warm, heartfelt, and satisfying chamber concert on March 18...The young virtuoso pianist, Michael Brown, took Beethoven’s role at the piano in all three works, engaging more and more deeply as the evening proceeded, the house warmed up, and the musicians sorted out the intimate communications which these challenging works require. Classical musicians face enormous expectations when they play a standard repertory work. Listeners have strong feelings about favorite pieces, even when they are open to fresh interpretive approaches...Franck’s Sonata for Cello and Piano in A [received] an ardent, bold performance by Mr. Müller-Schott and the formidable pianist Michael Brown...The program ended with Dvorak’s Piano Quartet in D (Op. 23), with the violist Paul Neubauer joining Mr. Sussmann, Mr. Müller-Schott and Mr. Brown. It was a lively, dynamic performance. The three young soloists were outstanding — Elena Urioste, violin, Nicholas Canellakis, cello (and the brother of the conductor) and Michael Brown, piano. They played with great familiarity with each other's technique, the cellist being the strongest of the three. Canellakis was, in fact, outstanding in his playing, with a sweet tone and vivacious accuracy. The most interesting music was with the soloists, whose intricate melodies blended so well, while the orchestra mainly was accompaniment, except at crucial loud tutti sections. Providing an even more significant contribution to the performance was gifted pianist-composer and rising star Michael Brown. Notwithstanding the technical demands and often-ferocious difficulties in the piano writing, Brown played glitteringly and with dazzling proficiency, demonstrating a keen understanding of the contemporary idiom that he undoubtedly utilizes as a composer. They gave a show that anyone, regardless of musical taste or knowledge would have enjoyed. Together they were enthralling and entertaining, and as individuals they were both fascinating in their own way. The only truly substantial offering came last, when Mr. Brown, Ms. Keefe and Mr. Marica gave a stunning performance of Ravel’s Piano Trio in A minor (representing France). Here, finally, was a wealth of delicate surprises, especially in the fascinating array of colors the players produced, from the monastic severity of the deep piano ruminations in the Passacaille to the iridescent halo created by the strings’s harmonics in the Finale. The centerpiece of the [Ravel] concerto, a languid, meditative, and lengthy discourse in slow triple meter, requires a different manner of control in order to maintain the listener’s attention, and Mr. Brown masterfully achieved this in his sensitive rendition. 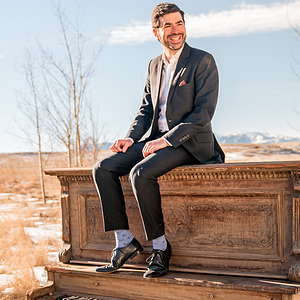 One of the two pianists of the evening, Michael Brown, an Avery Fisher Grant recipient and the festival’s commissioned composer, scampered and pounded through the thorny, difficult score with, of all things, a true collaborator’s modesty. Along with a lucid tone guided by a structurally intelligent mind, Brown brought the same professionalism to the hot, yet crystalline “Trois Chansons de Bilitis” of Debussy with mezzo-soprano Kelley O’Connor, who, along with Phillips, filled out the center of the program with song. Half the battle with Gottschalk is playing him with utter conviction. Brown won that battle, and brought a light touch to its lyrical moments and beautifully shaded pedaling to its more rambunctious outer sections. The concert opened with a confident and glittering rendition of Louis Moreau Gottschalk’s “The Union, Concert Paraphrase on National Airs” by the pianist Michael Brown. Michael Brown displayed a virtuosity one could only dream of, turning the Steinway piano into a one-piece marching band complete with trumpet calls and realistic sounding drum rolls with the left hand attacking keys in the bass while playing “Hail, Columbia” with his right hand. More trumpet, more octaves, and a triumphant finish left the audience only wanting for a fireworks reprise. The work's virtuoso demands were a stroll in the park for Mr. Brown, who simply rippled off the composer's flourishing flights and furbelows with sprightly brilliance. In his short, alluring composition, Mr. Brown wanted to represent the similarities between the four paintings, expanding and reusing motifs throughout the four movements. An enigmatic melody was woven through the transparent first movement. Vivacious flourishes dominated the energetic, denser second section; in the third movement, stark chords rang out with bell-like clarity in the upper register of the piano over insistent lower chords. The opening theme reappeared in the finale, hushed this time. No single performer with the Chamber Music Society of Lincoln Center had more work cut out for him in the society’s season opener than pianist Michael Brown. The young keyboardist was onstage for four of the six pieces presented at New York’s Kaplan Penthouse on Thursday night, and all complex, demanding compositions, many in the category of 12-tone music. So it was a relief, and an exhilaration, to see and hear Brown ably run a gantlet of modern classical taskmasters, in order: George Perle, Jonathan Harvey, Andrew Norman and Friedrich Cerha.